iBuildApp is proud to announce that you can now integrate OpenTable with your application. Once your restaurant becomes an affiliate with OpenTable, users can find your location, and reserve a table that’s available in advance. This is done automatically, allowing your hostess or receptionist more freedom to handle other tasks or taking care of other walk in customers. Your customers will certainly appreciate the extra attention. OpenTable provides other useful information to your customers, like location, parking information and hours of operation. Basically – everything that a customer needs can be found on this widget. An added benefit to participation with OpenTable is exposure. OpenTable.com displays new restaurants that were added to their site, what restaurants are available and, like other services such as Yelp, allow users to rate your restaurant. This free advertising can bring their users to you. 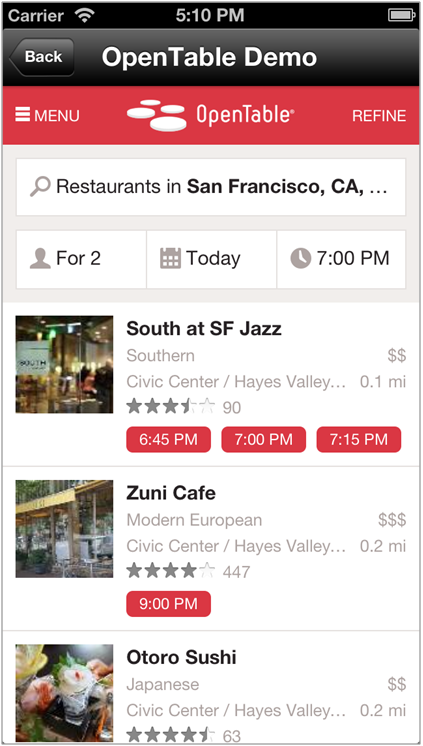 iBuildApps makes it easy to integrate OpenTable. All you need is your restaurant ID and the rest is handled automatically. If you have more than one location – they too can be supported all in one app.